up to 230 psi @ 73.4F max. These PVC ball valves are versatile plumbing fixtures to be used around your home. Much like stop valves, ball valves are used to regulate the flow of water from one branch to another. To install, use PVC primer and cement. Canarsee offers PVC Ball Valves in different sizes and connection types. The 770T03 from Matco-Norca is a 1/2” PVC Ball Valve, FPT Threaded, Sch. 40/80.Cross-Reference.. The 770S03 from Matco-Norca is a 1/2” PVC Ball Valve, Solvent Weld, Sch. 40/80.Cross-Reference..
Cross-Reference:Nibco: MA064A8 Hayward: QV1T075SE Spears: 19.. The 770T04 from Matco Norca is a 3/4” PVC Ball Valve, FPT Threaded, Sch. 40/80. Cross-Ref.. The 770T05 from Matco-Norca is a 1” PVC Ball Valve, FPT Threaded, Sch. 40/80. Cross-Refer.. The 770S05 from Matco-Norca is a 1” PVC Ball Valve, Solvent Weld, Sch. 40/80.Cross-Reference: .. 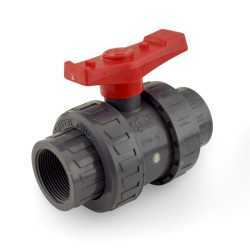 The 4602 from Webstone Valve is a 1/2” True Union PVC Ball Valve w/ both Socket and FPT Ends.F.. The 770T06 from Matco-Norca is a 1-1/4” PVC Ball Valve, FPT Threaded, Sch. 40/80.Cross-Referen.. The 770S06 from Matco-Norca is a 1-1/4” PVC Ball Valve, Solvent Weld, Sch. 40/80. Cross-R.. The 04603 from Webstone Valves is a 3/4” True Union PVC Ball Valve w/ both Socket & FPT ends.&nb.. The 770S07 from Matco-Norca is a 1-1/2” PVC Ball Valve, Solvent Weld, Sch. 40/80. Cross-R.. The 770T07 from Matco-Norca is a 1-1/2” PVC Ball Valve, FPT Threaded, Sch. 40/80. Cross-R.. The 770T08 from Matco-Norca is a 2” PVC Ball Valve, FPT Threaded, Sch. 40/80.Cross-References:.. The 770S08 from Matco-Norca is a 2” PVC Ball Valve, Solvent Weld, Sch. 40/80. Cross-Refer.. The 04606 from Webstone Valves is a 1-1/2” True Union PVC Ball Valve w/ both Socket & FPT ends. .. The 04605 from Webstone Valves is a 1-1/4” True Union PVC Ball Valve w/ both Socket & FPT ends.&..